Stabilizing hCG Weight Loss Higher in Phase 3 – When to ignore the 2 lb rule. Because I’ve had a rather unique journey with my weight loss and hCG, I have learned there is a time to completely ignore this “stay within 2lbs” rule while stabilizing in Phase 3 or you’ll literally drive your body and yourself mad. 1. You did not eat the fruits or melba/grissini in Phase 2, or you rarely did. 2. You have started a rigorous exercise program in P3. 3. You have done 10 steak days and your weight JUST. WON’T. STAY THERE. Let me make it clear – I do think doing Phase 2 without fruits and grissini if you have a sugar/carb addiction problem is a GREAT thing to do – but making this change in Phase 2 means that there will be some resulting adjustments in Phase 3 that you will need to account for, and that’s what this post is all about. I didn’t eat the fruits or melba on P2 for two rounds and it was the right choice for me. So don’t let me confuse you and make you thing doing Phase 2 in this way is a bad thing – it’s not – again, it’s just that if you do this, there are some things that change about stabilizing after. No fruits/melba on P2 = Artificially Low LDW. Meaning the weight you thought you lost? You really didn’t lose it all. I know, lets take a moment for a little sad face. 🙁 A little bit of that weight loss is actually what are called glycogen stores – or more simply, water that is naturally stored in your muscles and liver. It’s VERY important to note that if you did this, you will most likely need to stabilize at a higher weight – the 2 lb stabilization window really can’t apply in this scenario, and here’s why. When you remove the fruits and grissini from the protocol, it makes the diet super low carb – what this means is that your body will end up tapping into your glycogen stores for energy as well, something that wouldn’t end up happening as much when you leave the fruits in. Glycogen is basically just water that’s stored in your muscle and liver. Glycogen isn’t fat, and when your body is in it’s normal state, it will naturally hold a certain amount of glycogen (how much depends on your own body and how much muscle you have etc). It would really be not only pointless, but unhealthy to prevent this on an ongoing basis. When you have been fruitless in Phase 2 and then transition to Phase 3, your body will naturally re-fill these glycogen stores as quickly as possible – it’s just what the body does – there is no point in trying to prevent this. So what I’m basically saying is that if you do P2 without fruits and or melba, you will most likely have an artificially low LDW. That is why I wouldn’t recommend doing it this in order to lose more weight because in the end you are actually losing the same amount of fat as a person who keeps the fruits in (and remember, when I’m speaking of not eating fruits on P2, it’s with the understanding that the calories are being replace with more P2 veggies so the calorie intake is essentially the same, but lower carb). There ARE times you’ll find yourself eating less than 500 calories, but most of the time you’ll be fairly close to that number. The reason leaving them out can be advantageous is for the benefits of making the diet mentally easier – like I said, for me, cravings disappeared when I removed these items and made P2 much easier for me mentally. If it helps further as a comparison, out of my 4 successful rounds of the protocol where I followed P3 strictly each time, the 2 rounds I stabilized MOST easily (rounds 1 and 4) and within the 2lb window were the two rounds I DID eat the fruits (still no grissini). My body was able to retain it’s natural glycogen stores because of this so there was no need to recover this in P3. As a result, there was the initial little bit of weight fluctuation the first week of P3 but it quickly started stabilizing out and becoming pretty consistent each morning. In contrast, the 2 rounds that I gained several lbs in phase 3- about 7 lbs actually each time, were the 2 rounds that I DIDN’T eat the fruits (3rd and 5th round) – my body fat testing showed the majority of the weight gain each of these times was indeed “muscle” which also includes the glycogen stores the muscles hold. It can be really hard to know what’s what without the bodyfat testing, because the added lbs of glycogen and muscle do cause increases in measurements as well because there is no fat loss happening at the same time at this point to compensate. I’ll try to make a more detailed post about this in the future, but we discuss this topic specifically in my chat with B from Episode 7 of the Diet Interviews. So essentially, the thing is this. If you choose to eliminate the fruits and grissini during Phase 2, be mentally prepared in advance that your LDW is not really accurate – it’s artificially low – and be already prepared to purposefully stabilize at a higher weight and measurements. This is NOT failure, which is why it’s so important to address this because without this knowledge you’ll feel you’re overeating or that your body is not working properly etc which could really get you down. You have to accept this as part of your own weight loss process if you choose to go about a round of the diet this way or you’ll go crazy with yourself. 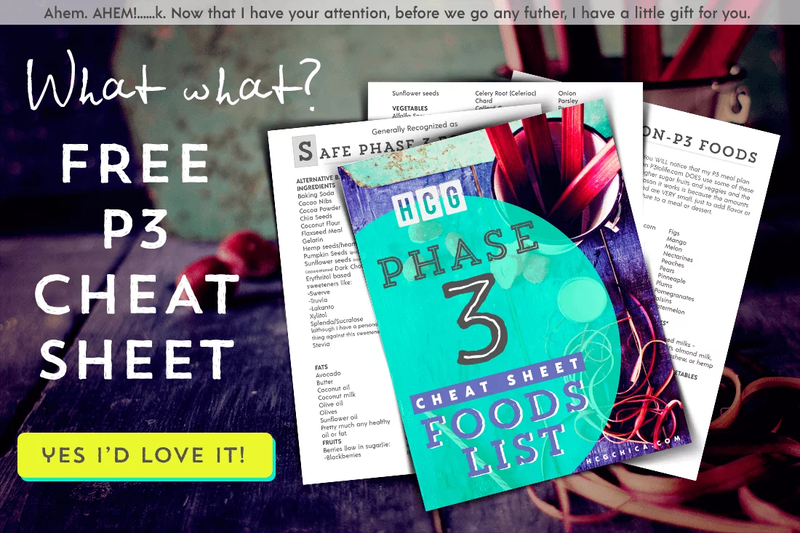 can you go from phase 2 hcg diet to the keto diet skipping Phase 3 hcg diet. if no, why not? I am on around 5 and this is my 4th day of P3, ever since my first round I’ve been following your site, it’s helped me tremendously! Since starting this round’s P3, I have had terrible stomach cramping and diarrhea within a few hours of eating, a first out of all my rounds. I have been eating to hunger and adding new foods in small increments. This is weird, and I’m gaining .1 or .2lbs, which is still under my LDW. Any idea what is bringing this on? Maybe my body is just trying to acclimate to the oil’s and new food? I’m so weak and pooped (couldn’t resist ) and I’m keeping up with my water intake, but I’m scared to eat aything because I’ll be back in the bathroom. Even eating the P2 foods and just doubling the protein gives me same results. Hey Aprilcots! Oh man I’m so sorry to hear this- to be honest I have no idea why this would be. If you do P2 with no fruit and then the week prior to the last day that you take hCG you add apples back in can this help you stabilize within 2 pounds of your LD W wait? So it sounds like within the 7 pound range is the expected stabilization point? I was so happy to find this post. After my last round I wanted to cry because I kept going up the minute I added anything slightly higher in carbs back in. I hadn’t had any fruit or melba, so it was probably glycogen stores re stabilizing! You’re awesome. Okay I have a question. I had stalled for a week straight. I did a apple day and it didn’t help at all. So then I seen, a suggestion about not eating fruit or melba toast. So I tried 5 days ago on Friday.. Well kind of. I ended up only eating 4 strawberries and split a melba toast for both meals. It worked. I was down 2 pounds the next day (Saturday). Then on Sunday I lost another pound and then 1 more on Monday. Tuesday, only .5 and today woke to only losing .1 , which is okay. I knew that would probably happen, but now just watched the video about the no fruit issue. If I go back to eating the recommended amount of fruit will I go up the 5 pounds again, or did it help that I didn’t completely cut it out. Should I just add a little extra fruit tomorrow. What do you recommend? What about an apple day in the next few days if I stall again? I feel so nervous to do anything wrong. I only have a week left of Phase 2. I didn’t nearly lose what I had hoped and I was so completely careful with no mistakes since day 1. So I have been discouraged. I don’t know if it’s because of blood pressure meds or what. Any suggestions on how to handle the fruit til I’m done next Weds? First of all, I have to tell you, your website is fantastic. It’s really helped me and I’m sure so many others. I hadn’t heard back from, but there was not much I could do anyways. Just had to calm down, I was so happy to have lost 1 pound. Then I ended up running out of my drops on Saturday. 3 days early. I’m today on 72 hours of no drops 500 calories. Tomorrow is officially Phase 3. I read we should add a little more calories. I added an extra 150 calories and oh my gosh, it was so hard. I was stuffed and ended up getting a stomach ache. I thought 150 calories would be a good way to ease, but my body had a hard time. Maybe it was too much? I’m going to probably eat about the next few days. Is that what you would recommend? I was also trying to find out about how many Net Carbs are we allowed in phase 3. Eating out Saturday and was going to get a side salad , but it’s listing to have a lot of carbs in the lettuce and veggies and still not sure about what dressing? I want to avoid oil for a whiled. Thank you for everything. Hi! First of all, I’m finding your site SO valuable and full of wonderful information. Something I’m not finding info on (anywhere!) is what to do if you are more than 2 lbs under LDW. Today is the 13th day of P3 and yesterday morning as well as this morning, I’m at 2.6 under LDW. I was stable for several days and went up a bit right before my period started. I will admit I am having difficulty with consuming larger portions and calories to equal what they “should” for my second week on P3; and because I’m allergic to gluten, I never ate the Melba in p2, but did eat the fruits allowed. I’ve seen conflicting advice on the few entries out there regarding loss on p3, like “eat 4 meals” and “just consider yourself lucky and enjoy it”! But I really don’t want this to be messed up. I’m honestly impressed that I haven’t gone back to eating the way I did before doing hcg and I thought for sure I’d have needed a steak day by now! Lol any suggestions??? You are a lifesaver! That’s just what I wanted to hear! Haha. Thank you for answering so quickly. I appreciate the input about our bodies doing what they’re comfortable with and that THAT is what matters more. I think it’s silly and counterproductive (no??) to force yourself to eat calories when we just spent how much time (and money!) training our bodies to be satisfied with less! I’m loving my choices in p3 and can’t wait until I can start my next round! I have gotten many comments and compliments during the first round and that’s (only lol) 22 lbs! Imagine 22 more! 🙂 thanks again!